In April 2003, Northwest Airlines introduced its first new livery since 1989, to be phased into the entire Northwest fleet over a five-year period during regularly scheduled repainting.In 2009 Northwest merged with Delta Air Lines ending the use of this livery. The Boeing 757 is a twin-engine, short- to medium-range jetliner. It is up to 80 percent more fuel efficient than the older 727 jetliners it was designed to replace, but retains the 727's short-field capability. 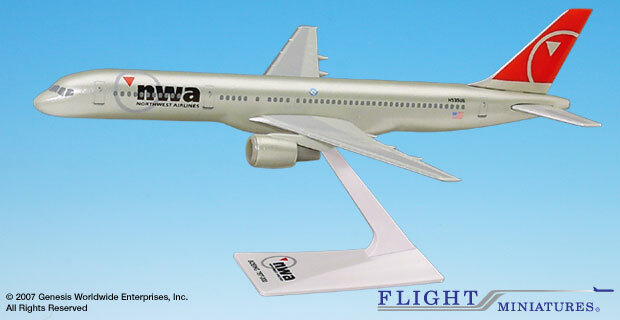 The 757-200 carries up to 228 passengers and has a range of approximately 3,900 nautical miles.